The 2015 edition of the South European Championship was held in Portoroz, Slovenia, organized by Jahtni Klub Portoroz. Slovenia is a young country, independent since 1991, with only about 20 nautical miles of coastline but a strong interest in sailing. 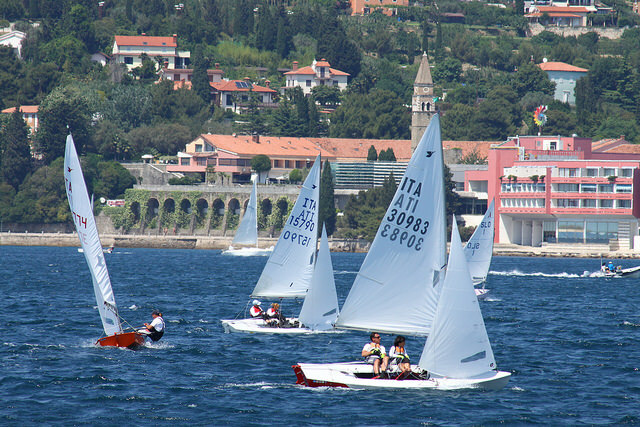 In 2014 Portoroz hosted a Snipe regatta and sailors experienced the hospitality of the club and the excellent race area. So for 2015 SCIRA Italy proposed the bid (and then got the support of the European National Secretaries) for Portoroz to host the South European Championship, even though there is not yet a Snipe fleet in Slovenia. The choice was apt because the bay of Portoroz is an ideal race area for the Snipe, both with the sea breeze and the “bora” (offshore wind).